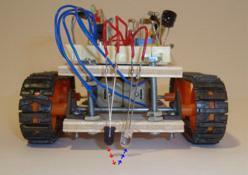 Chris over at PyroElectro.com sent along a link to his write-up for building a mini-tank line follower robot. I thought I'd pass it along for those itching for a fun DIY robotics project to work on. If you've never built a robot before this could be your first! It's based on a Tamiya tank kit, gearbox, and basic discrete analog components to follow a line. The write-up includes parts list, circuit diagrams, and very detailed instructions for constructing the robot. Nice! Also included is a movie of the robot in action. It looks like it works really well. Nicely done, Chris! This PyroElectro.com site has all kinds of interesting projects from guitar tube amps to turning your oscilloscope into a TV to various robotics projects. Definitely sub'ing to the RSS feed. Thanks for the link, looks like a cool kit. Will take a look at the other OWI kits.